Tour through Blogland - Home. Made. Interest. - Home. Made. Interest. 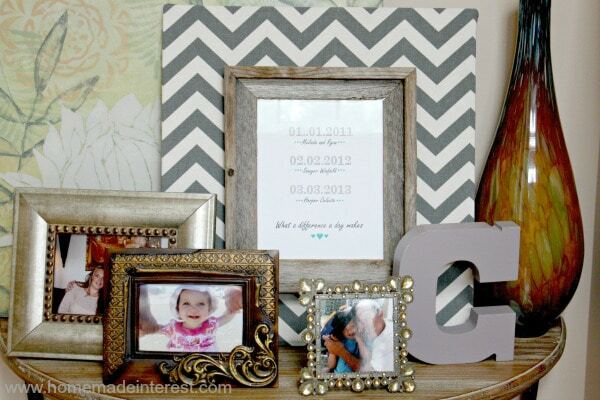 Home » Create » Crafts » Tour through Blogland – Home. Made. Interest. We’re so excited because today we are participating in a Tour Through Blogland! Erin from The Blue Eyed Dove gave us a peek at her home and the projects she is working on last week and was sweet enough to invite us to give our own tour this week. Erin loves crafting, decorating, party planning, shopping (a girl after our own hearts!) and has a fun blog where she shows off her creativity. Make sure you hop over to her blog and check out all of the things she’s been working on! It’s taken me a few years and multiple decorating attempts to really find my style but I think I’m finally there. I’m a mid-century modern kinda girl! I recently replaced my couch with a mid-century modern sectional that I love and I’ve added drum shade ceiling fixtures. My color scheme is slowly transitioning over to shades of gray with teal accents. My latest big project is new built-in bookcases for my living room that I made using Billy Bookcases from Ikea. My dad was nice enough to spend a couple of weekends working on it with me and I loved doing it. It has totally transformed the room! You might be able tell from some of my knick knacks I’m also slightly peacock obsessed…it’s nice to have more room for all of the cute decor I come across. 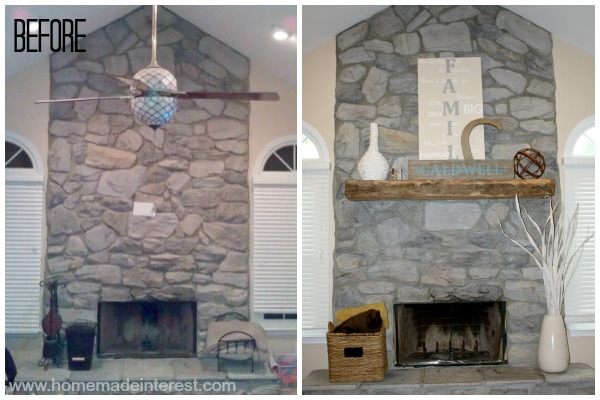 Melinda: My decorating style is rustic and focal point of my house is the large flagstone fireplace in the living room. I fell in love with my house because of it. A couple of years ago I made it my mission to find the perfect mantel for it. It took a lot of searching and a long drive out to a small salvage yard in the middle of no where but in the end I found it! 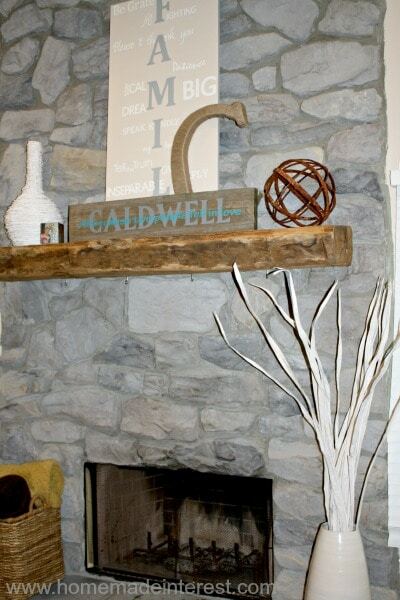 I now have a beautiful, 100+ year old, barnwood beam as my mantel and I love it! My other rustic decor has kind of grown up around it and all that shelf space gives me lots of room to display my crafty projects. We always have so many projects floating around in our heads! With two houses the list of things to do is never-ending. Kat: Right now I have a list a mile long of D.I.Y stuff I want to get done around the house. I have big plans for a table/shelf behind my sofa, which is a sectional that will give me a place to put lamps and push the sofa away from the wall a little. I also have an Ikea Rast hack (side table makeover) that I’ve been dreaming up. I think I have it planned out now so I’m hoping to get it started soon. 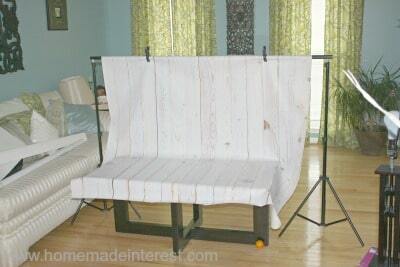 Melinda: I have just about conquered the blank walls in my living room and now I’m ready to try reupholstering a chair for my guest room. This will be my first time reupholstering anything so wish me luck! You’ll probably be seeing a few posts on headboards in the next few months since both Kat and I have beds we’d like to make headboards for. How does our work differ from those in our genre? Hmm, I know we’re all supposed to be unique but I don’t think we differ all that much from others in our genre. We’re fun-loving ladies who like to create things. I think the fact that we are two besties working together makes us a little different, and the fact that we both come from different perspectives. 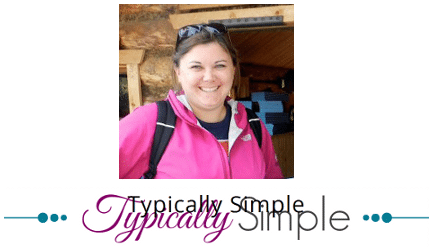 Melinda is a mom, and loves all things rustic and I’m an aunt who’s a fan of midcentury modern. Of course, in the end we both just love beautiful rooms and creative projects no matter what style they are. What a Difference a Day Makes art Kat made Melinda for her birthday…do you see a theme here? Why do we write/create what we do? We started working on home décor, D.I.Y. and craft projects together and separately long before we began writing our blog. We love to create things, plan parties and just see what kind of stuff we can come up with and whether or not we can actually do it. I’d say Pinterest is what really motivated us to start working on more projects. We’d see so many cool ideas and we got tired of just re-pinning them and never actually making any of them. So, we started having a weekly craft night, and then we decided we wanted people to see what we were doing. Eventually we got around to starting our blog, just a short 4 months ago, and here we are 🙂 . We’re planners. We make lists, we make schedules, we sit around the table brainstorming. We get together at least once a week and if we aren’t working on a project we are planning out our next three. Currently we have several blog post categories that we want to cover each month. Based on those we will sit around the table after Melinda has put her kids to bed and we’ll look through Pinterest and see what’s trending, we’ll talk over favorite foods and recipes we’d love to try, and we’ll see what social events are coming up that we might be able to make something for. For example, in October our friend’s son is getting married so you’re going to be seeing lots of rustic wedding projects on the blog! Our glamorous photo studio…don’t be jealous! Once we have our ideas and everything is tentatively scheduled we pick a weekend or two to get a bunch of projects done all at one time. We work on stuff during the week too, but a monthly project blitz takes some of the pressure off and also gives us a chance to take photos for the blog in good lighting. It’s hard when you only have time to work on projects after the sun goes down. We’re new, but we are loving the blog and seeing what our fellow bloggers are working on really helps get the creative juices flowing. We’re inspired daily by all of the unique, creative projects out there! Hi there! I’m Kelly from the Chicago suburbs. I am teacher turned stay at home mom to my little guy who just turned one. My husband encouraged me to start a blog about two years ago to share some of the products I was making for my Etsy shop. When my little guy was about 6 months old, I needed a creative outlet as the winter was getting quite long. So I decided to start blogging again, this time more consistently and about everything from crafts and recipes to kids’ activities and life’s adventures! Hi! I’m Sarah, the voice behind Little Red Brick House. My blog was born from my insatiable need for creativity, which I channel through my various DIY/craft projects. There’s no feeling quite like making something with your own hands. My hope is to encourage and inspire others to unleash their creativity by tackling home decor projects on their own. Make sure to stop by their blogs next Monday for their tours. We can’t wait to see what they have to share! I loved learning a little bit more about you ladies and your blogging process! 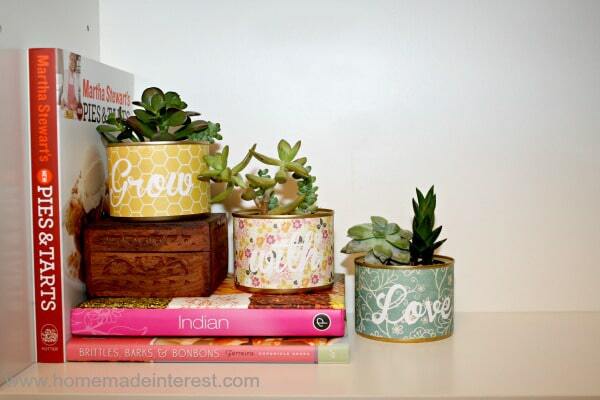 Your projects and home decor are super cute! I especially like the peacock accessories (Kat), and the rustic mantle decor (Melinda). You’re photo studio is pretty high-tech compared to mine 🙂 Love it! Keep up the great work, and thanks for joining me on the tour! Thanks for checking it out Erin, we’re going to have to make sure we give each other a heads up when we see a cute new peacock find! Thanks Jayleen, I’ve really enjoyed meeting some of our fellow bloggers. Cant wait to see what the ladies link up next week! I just realized that between link ups and pinterest I’ve ended up at 5 of your 6 most recent posts. I guess you just keep catching my eye, so I’m now following on bloglovin. I look forward to reading more. That is an awesome compliment, thank you!! Hi, I’ve just found you through a linky, and I really need to tell you that you’ve made an awesome thumbnail picture. The photo and the fonts are really inviting and the colors are superb! Thanks Cathy. I would have to say that my mantel is my favorite too. Wish I could take it with me if I ever move. I love Melinda’s gallery wall with the scrabble pieces that’s awesome. I mught look at doing something like that here. Thanks Toni, the scrabble pieces definitely make it look unique. Thank you for giving a peak inside your homes! I love the mid-century sofa…and the mantel…I swoon! It was wonderful of you to share at Party in Your PJs, we love having you! 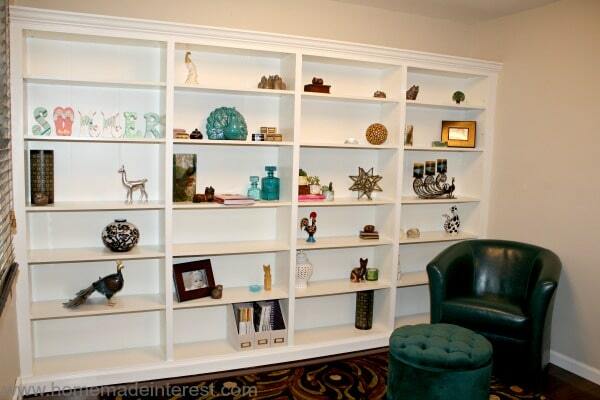 Okay, that bookshelf wall is incredible! The space looks twice as big! I love those bird prints too 🙂 You have a gorgeous home! 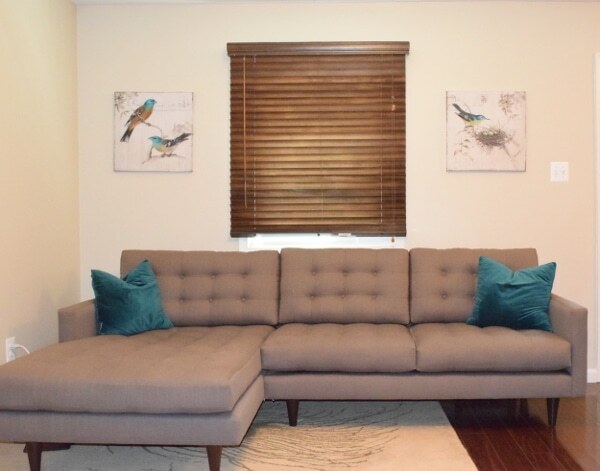 Thanks April, I found those bird prints on Wayfair and they were too perfect to pass up! I like the rustic touches. 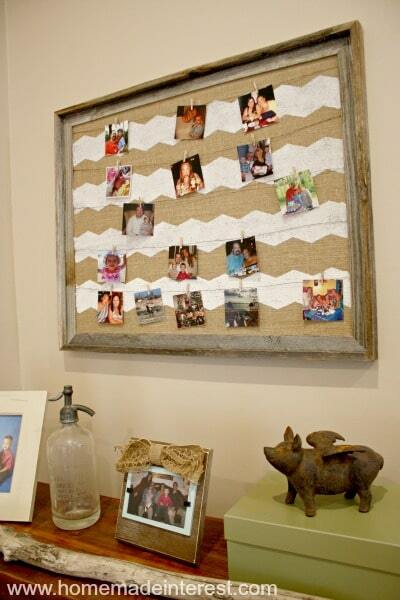 And your family wall art is very creative and sweet. Thanks Michelle, we have had a lot of fun making things for Melinda’s gallery wall. What a lovely idea for a post and a great way to get to know everyone a little bit better. I love the gallery wall. It’s something a little different than just having the family photo up. It’s quirky and cool. I can’t wait to see what this week’s tours look like! Thank you for sharing this post with What You Wish Wednesday!!! Come back this week and share some more! I love the before and afters. I really enjoyed looking around y’alls blog and finding out more. 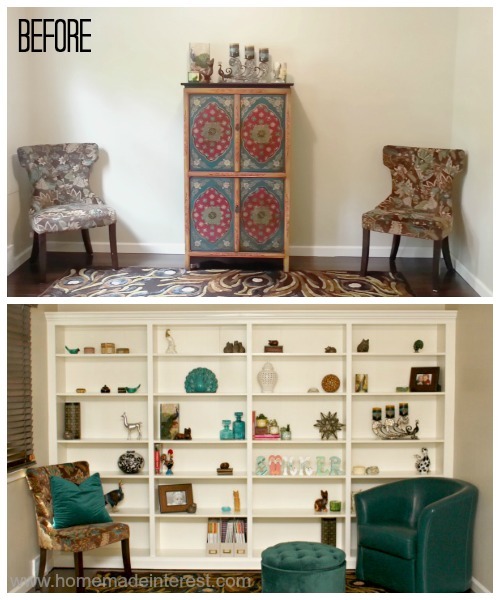 Such a cool little space in blogland! Look forward to more!!! Thanks Leslie, we will be back this week! Oh my goodness… this home tour is awesome! So much inspiration! Loved finding you through WYWW! 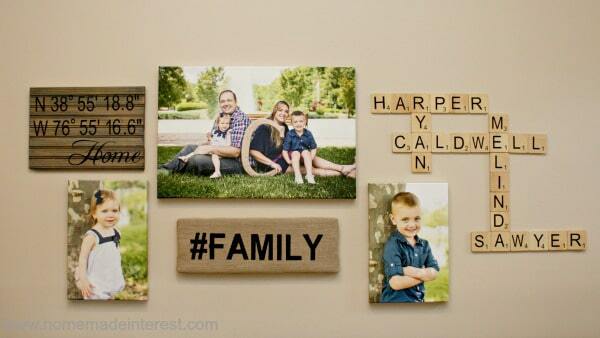 I really, REALLY love the scrabble on the board in conjunction with your family photos!! Thanks Cathy, it was a fun project to do! Wow! What beautiful houses! Thanks for sharing with us in the Bloggers Brags Pinterest Party! Come again soon! Hi! I found you through Pretty Pintastic #15! I love your couch – I’m looking for something almost exactly like it – can I ask where you found it? So glad I found your blog – you’ve got a new fan & follower! Thank you! I should have put that in the post. I got it from Thrive Furniture, it is the Tyler Sectional in Klein Gray. I absolutely love it!